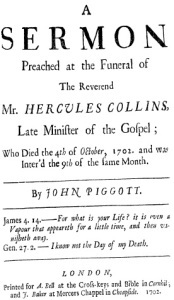 Hercules Collins died on October 4, 1702. He was interred five days later at Bunhill Field, the burial ground of dissenters. His funeral sermon was preached by John Piggott, a Seventh-Day Baptist who was renown for his funeral sermons. He preached a number of sermons around this time at the funeral services of prominent London Baptist pastors. The sermon was based on Matthew 24:44, “Therefore be ye also ready; for in such an Hour as you think not, the Son of Man cometh. The first part of the sermon focused on the biblical text. 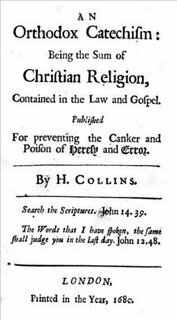 The latter part of the sermon summarized the life of Collins. This section of the sermon is excerpted below.